The labor of all our cumulative love for poetry and literature is out in Amazon. Thank you Dr. Ampat Koshy and Reena Prasad wholeheartedly for making all our dreams come true! 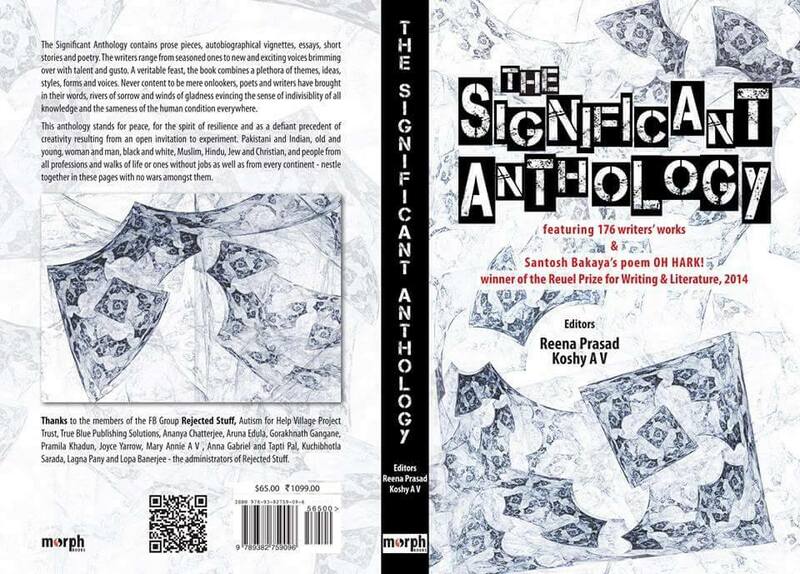 It has been an honor and privilege to share space in the anthology with literary greats from India and over the world, and to find such a caring and coveted home for my poem ‘A Woman I Am’ in ‘The Significant Anthology’, published by Morph Books in July 2015. Eagerly waiting to hold the book in my hands. Truly happy and excited about its worldwide launch and it has been an enthralling journey ever since I have been a part of the Rejected Stuff literature and poetry group in Facebook. Sharing a few moments from the beautifully eloquent speech of Dr. Ampat Koshy, the editor extraordinaire of The Significant Anthology, where he shares the joy of creating this beautiful mosaic of creative expressions from deserving poets and writers from all around the world in the book launch hosted in Bangalore, India.